Jessie and I celebrated “our” Valentine’s Day a couple days ago since we couldn’t be together yesterday. We planned to indulge and hit up the all-you-can-eat crab buffet at the casino, get a drink, and maybe play a couple rounds of my new fave slot machine, Maltese Fortune. Why Maltese Fortune? Because I kinda think gambling is dumb, and of all the lame slots they have I chose Maltese Fortune because I like dogs and dogs like me so I figure the dogs would be on my side and get me tons of money. My logic is obviously spot-on here. Maltese dogs will make me a freaking millionaire. So back to the buffet. I am awful at buffets. Straight up RIDICULOUS. I go in thinking I have this awesome game plan, like I’m gonna get a reasonable amount of crab legs and some salad with light dressing, then maybe have a fruit parfait for dessert and leave slightly fat and happy. Nope. Fat and happy? Salad? Who am I?! Basically, we got our table and I bolted to the crab line, grabbed about two whole crabs as well as random things I have no idea what I thought of when I plonked them on my plate. Chicken mu shu, pork chow mein, some weird pretzel-looking roll, clams!! and the like. By the time I got back to my table, I stared at my plate as if I sat in front of someone else’s. Seriously? WTF. Clams? I hadn’t even had any alcohol yet. Why the hell did I get clams? And chow mein? I love chow mein, but I’m at a crab buffet, not Panda Express. What was I thinking? So I miserably picked at my plate hoping Jessie would get up really quick so I could trash the scraps of food I stupidly adopted onto my plate. While the crab was delicious (and surprise, the Brussels sprouts–my new fave) I was not a fan of the clams. Sandy food that tastes like fishy gum? Uuugh. My taste buds needed an intervention and a new palette-cleanser and quick! Off to the dessert buffet. Here’s where another problem lies. It’s no secret I’m not the biggest fan of dessert. Making it, yes (obviously). Eating it, not so much. So why did I grab a lemon meringue pie, cheesecake, a berry parfait and a cookie? And I ate the whole thing, minus a lone blackberry and half my snickerdoodle, but only due to the fact that my pants were now around my ankles and I was being escorted out of the casino via stretcher. Meanwhile this whole time, Jessie had his eyes focused on shrimp and crab only. And here I was, pretending I was an obese woman for a day stuffing my face with thousands of calories and pretending I like clams. And Jessie just sat there adorably, slurping up buttery crab and avoiding the fact that we were at a buffet with a million other temptations lying around. Buffets are kinda like whorehouses for food. You aren’t really interested in weird stuff until it’s luring you in under its heat lamp… er, okay, maybe they’re not like that at all. Anyway. I’m done with buffets. At least, for another week. Crab buffets are only on Fridays. Wanna know what is appealing in any circumstance? 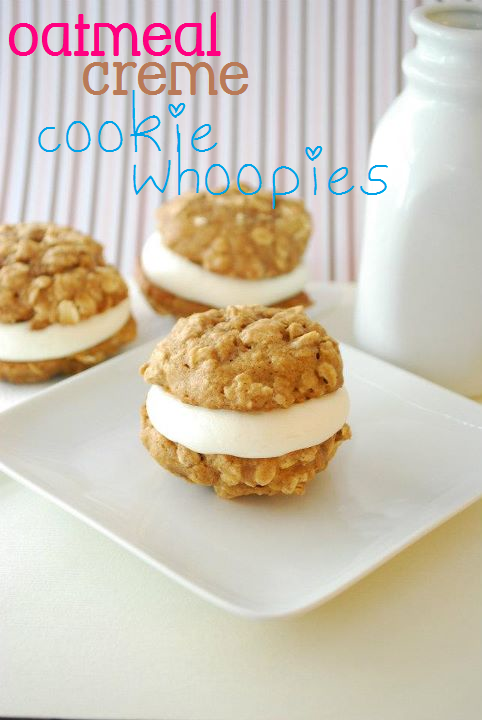 Oatmeal Creme Pies. I love them and ate them by the handfuls as a kiddie. And so one day, I thought–they’re kind of like a whoopie pie in a weird way. Why not make them more whoopie-like? Alas, these sweet creations were born. 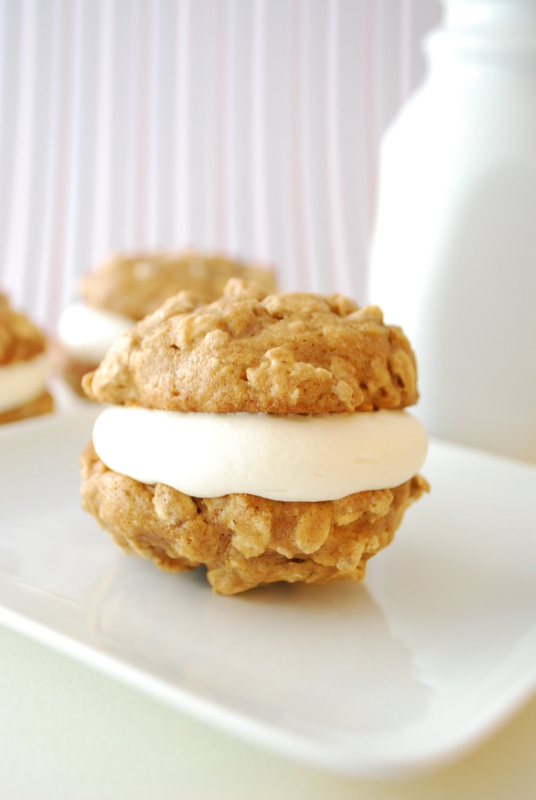 Like a cross between an oatmeal creme pie and a whoopie pie, they’re delightfully chewy oatmeal cookies sandwiched around a fluffy marshmallow filling. And you will want to come back for fourths. 1. Preheat oven to 350 degrees F. Lightly grease two cookie sheets with cooking spray and blot excess with a paper towel. Set aside. 2. 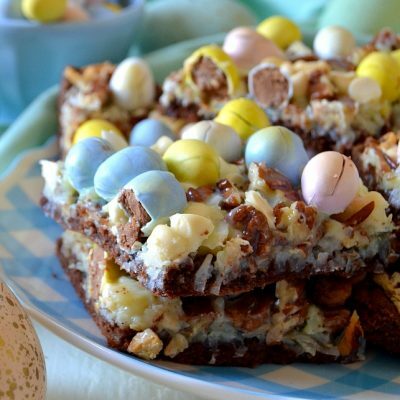 In a large bowl, mix together the cake mix, eggs, oil, and applesauce until blended. Stir in the oats. Portion in heaping Tablespoonfuls onto the prepared cookie sheets and bake for approx. 10 mins, rotating pans halfway through cook time. Allow to cool 5 mins on sheets before transferring to a wire rack to cool completely. Prepare frosting. 1. 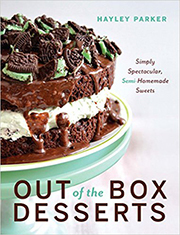 In the bowl of a stand mixer, beat together the butter and vanilla until creamy. Beat in the marshmallow creme until fluffy and combined, about 1 minute. Gradually begin adding powdered sugar, about a cup at a time, until frosting is light and fluffy. You may use less powdered sugar than I suggested; however, it’s good to have on hand in case your frosting is too drippy or runny. 2. 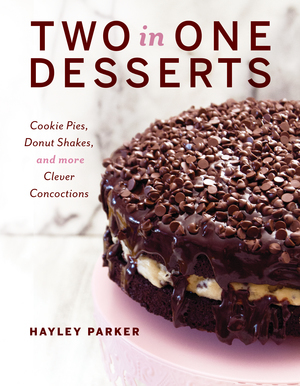 Pipe or spread frosting by a heaping Tablespoonful or two onto one flat bottom of a cookie; top with another like-sized cookie to form a sandwich. Repeat until all cookies are sandwiched. You may have extra filling–I may suggest using a spoon to get rid of that, or store it for another use in your fridge. 3. Keep these sammies wrapped up airtight for about 2 days. 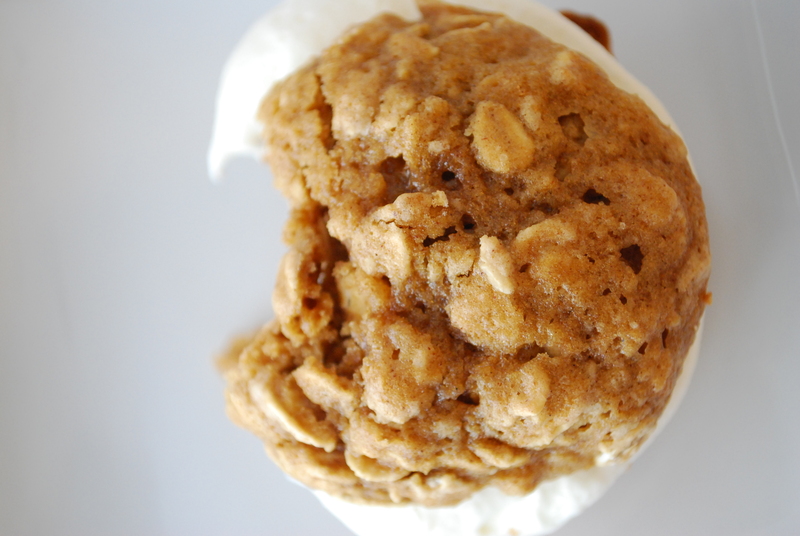 I love the texture of oatmeal cookies, and homemade oatmeal cookies are so comforting–these are no exception. And the frosting makes these so reminiscent of the Lil Debbie pies. You’ll love them!! Have a happy Wednesday, cutie pies! Ha- I like that line too. Hope the doggies were nice to you! The whoopsies look great! Ohmygosh, I’m the same way at buffets…I end up taking stuff I wouldn’t normally eat and then wonder how/why it ended up on my plate! These pies on the other hand, are a definite MUST EAT. 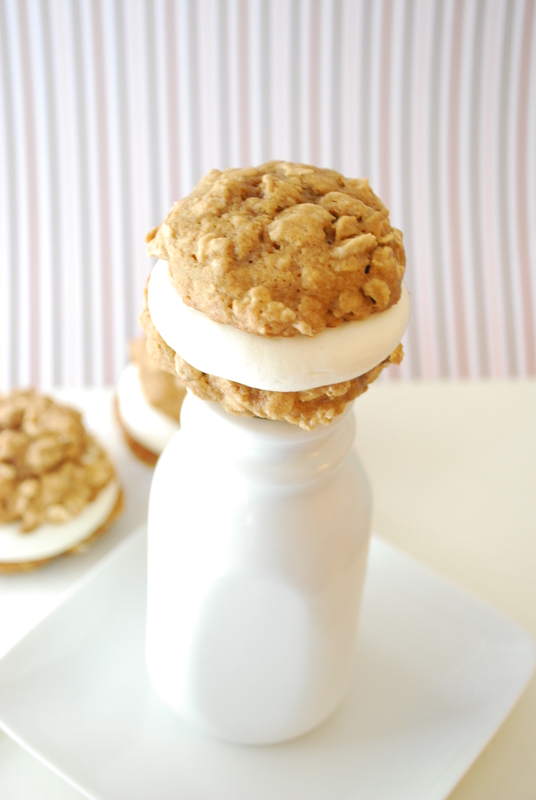 Oatmeal cookies are my favorite, and these look just amazing! Of every cookie on Dorothy’s 160 cookie roundup today, THESE were the ones I clicked over to…and of course, they’re yours 🙂 pinned FABULOUS!